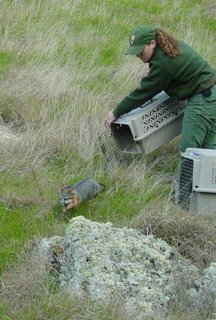 October 8, 2007 was another landmark day in the ongoing recovery of our endangered island foxes on the California Channel Islands. Yesterday, 10 island fox pups, born as part of the captive breeding program on Santa Cruz Island, were released into the wild. Due to the success of several conservation efforts the fortunes of these newly released foxes look hopeful. Since 2002, captive breeding on Santa Cruz has produced over 85 fox pups and the overall Santa Cruz Island fox population has increased to approximately 300. Golden eagles that nearly ate the foxes into extinction, have been almost completely removed from the island and bald eagles, that were reintroduced to the northern islands beginning in 2000, are now breeding successfully and repopulating their historic home. Currently, 40 bald eagles reside on the northern islands. The fox population on Santa Cruz Island has more than tripled since the island fox was listed as an endangered species just three years ago. If everything continues to go well, all of the remaining island foxes in the breeding facility on Santa Cruz will be released back into the wild before the end of 2007. You can help support that “ray of hope” and the island foxes being released into the wild. Your donation of $250 puts a radio collar on an island fox so it can be monitored in the wild. 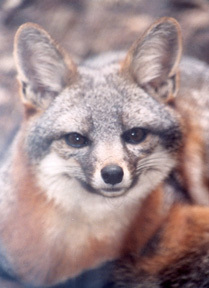 $100 helps pay for biological research into island fox diseases. $50 funds materials to raise awareness about the island fox at a school visit or a community event. With your help, Friends of the Island Fox is helping to make a difference. 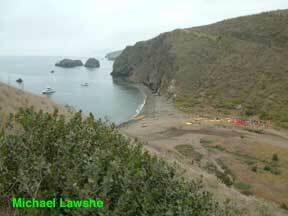 Working Together We Can Save the Island Fox and create a community that treasures our Channel Islands.